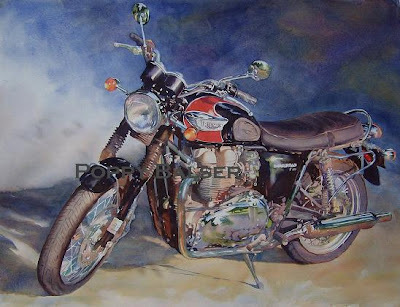 Paintings by Poppy: Triumph Bonneville T100, finished! This painting is not for sale. It is being raffled off at the Wharf Rat Rally in Digby this weekend. The tickets will be sold in downtown Digby this weekend, starting on Friday Sept 4. Terrific finish and the background is wonderful. I hope the raffle is very successful.